A trim, tufted native perennial on Trail 15 in the swale at the serpentine contact 65 yards south of Vestal’s exclosure, Trail 9 at the serpentine/chert contact, and elsewhere along Road F north of the Trail 9 intersection, and other shallow drainages, especially on serpentine. 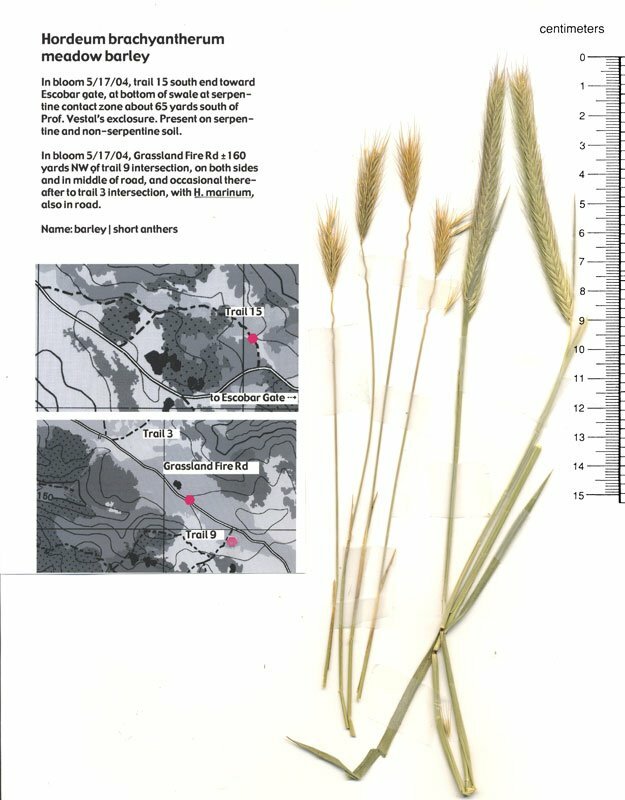 The old Hordeae (barley) tribe was characterized by sessile spikelets on opposite sides of the rachis. This small, temperate region tribe has included some of the world’s most important cereals: wheat, barley, and rye. It also includes our native Elymus species. Name: barley | short anthers. Photo right by Toni Corelli, 7/19/06. 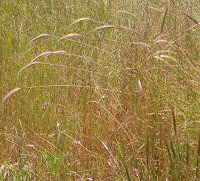 Hordeum brachyantherum on Trail 15. Elymus multisetus is in the foreground right.